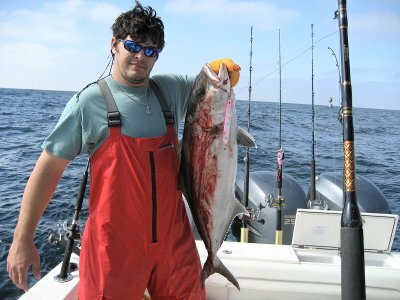 I sent an email a few weeks back with a picture of an amberjack that I caught with the " cotton candy " jig. With a greatly appreciated gift from Tormenter ( 3 cotton cady jigs), we set out to the same rigs we fished three weeks in a row. 95% of our fish caught during this trip were on freestyle jigs. 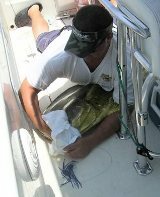 50% of which were caught using the jig in the photo I have attached, We caught all species from two 20 lb Red Snappers(which had to be released), five 25-30 lb Gag grouper, five 30-40 lb amberjack, a few scamp grouper, lane snapper, and almaco jack. The Tormenter Jigs are blowing peoples minds when I tell them that we rarely use live or dead bait. 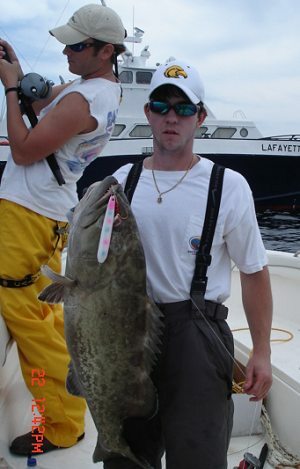 Thanks again Tormenter Tackle and attached is another photo of a nice gag grouper my buddy fishing with me caught around 110 miles south of Biloxi, MS.
We had some great luck with your lures. Fished the Striker 2 day tournament in New Smyrna Beach May 23,24 2008. Dan Jacobs handed me a lure at the Captain's party the night before. I liked the shape and color so much I rigged it up on a wire leader in front of a bally hoo. 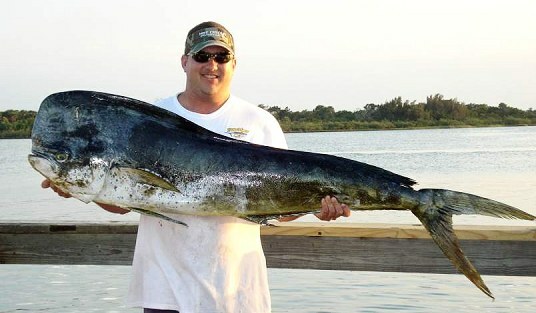 On day 1 it produced a 31 lb dolphin and on day 2 that same lure met a 58.6 pounder! It was a dark blue/light blue bonehead. 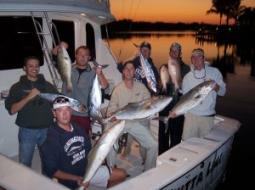 My son, Justin Larson, is the one in the pictures, who reeled it in. 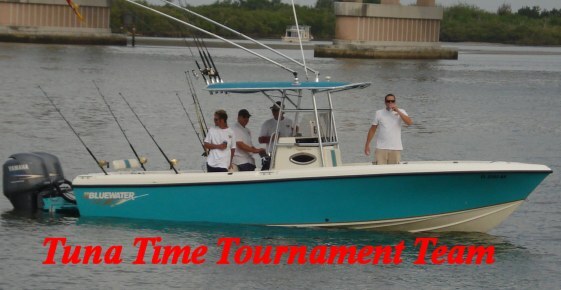 It got us the largest offshore fish in the tournament, and second overall boat. I will use those lures extensively in the future. I fish about a dozen tournaments a year. Hope you can make out the lure on deck with Justin and that fish in a headlock. 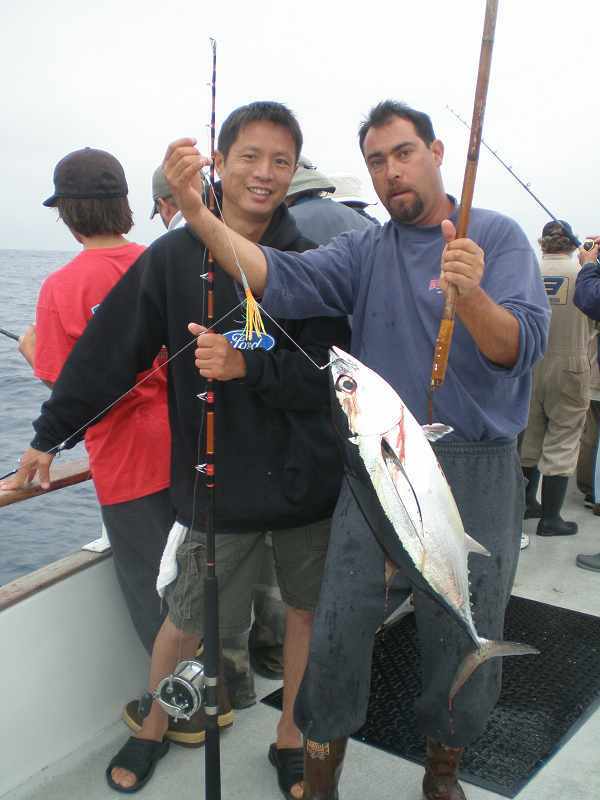 The July 4th two day Tuna charter aboard the pacific star captained by Mike Bullock, and Sponsored by tormenter fishing products was a great success. 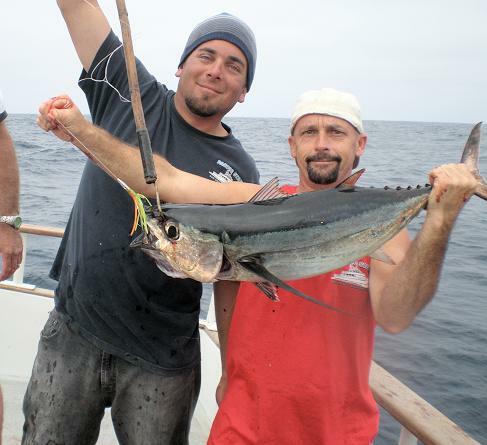 Despite rough weather, we managed to catch numerous Albacore Tuna, and every tuna caught on the troll was caught on a Tormenter lure. In particular the Mini Tuna dart in red and black, and the red and black steel head. The Tormenter representative Kevin was very helpful and supportive to the passengers and crew. Tormenter was also generous to donate numerous prizes to the passengers that they truly enjoyed. I give my full support to Tormenter and would love to have Kevin and the rest of the Tormenter team on board the Pacific star in the future. We now proudly display the Tormenter name aboard the Pacific Star and the rest of the fleet out of the Seaforth Marina. 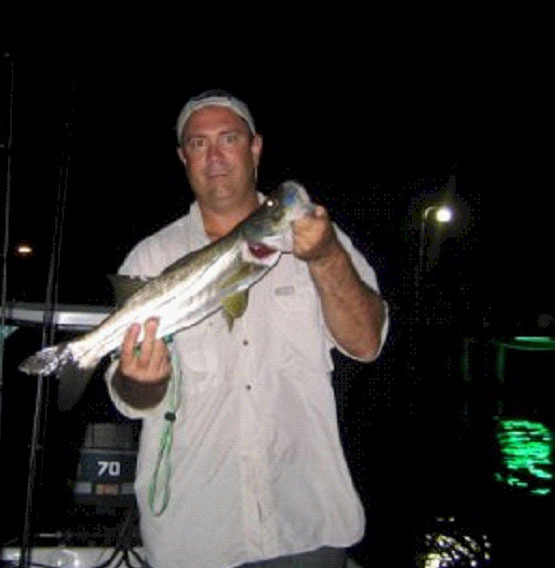 Wanted to let you know that I caught six snook in 1 1/2 hrs the other night at the Roosevelt Bridge (Stuart). During the time I was there there were about 15 people on the bridge and I only saw one other snook caught. These fish were caught in various locations on the cat walk; every time I would leave a spot someone would try fishing from there. I have fished 3 different colors of the finger mullet and they all seem to make the fish hit. After catching 6 snook and beating the lure against the wall under the bridge the lure looks like new, this is one tough lure. Here is a picture of a fish from another night caught under the green light in the back ground.